I encountered this book entirely by accident. I was doing a web search for images to serve as inspiration for the cover design for one of our “Ione D.” steampunk novels. This cover appeared, an illustration of a young woman in a long dress and high boots running through a Chinese street scene. It looks like a Victorian-era “penny dreadful” complete with a price in shillings. By the way, the author, R. S. Fleming is a veteran of the Canadian armed forces, which is my Veteran’s Day* tie-in. This short novel, published in 2013 by Dancing Cat Books, is targeted at a young adult audience. The titular Kate is a bright young woman just out of school who hails from an aristocratic family. As is typical for this kind of story, she’s at odds with her mother, who wants her to court and marry a suitable young man. Kate craves adventure, and the man she fancies is not someone her mother approves of. He’s Henry Tattersall, a brilliant young doctor working in the British area of Canton. Therefore the title is a spoiler because the two have only met once when the book opens. The book has a great Victorian feel, with vivid descriptions of Kate’s hair, clothing, and the social niceties of the day. Unfortunately, this makes for a slow-paced opening which is not representative of the rest of the book. Kate is both feminine and proper, but she defies tradition in her interest in “male” subjects. Her older brother Jack is an inventor who dabbles in firearms and other gadgets. Kate has helped him evaluate his inventions and consequently, she’s a crack shot. She’s arranged to travel with him to China where she looks forward to seeing Henry again. Due to an urgent government project, Jack can’t go but saves the day by arranging for her nanny Mrs. Farewell to travel with Kate. Parts of the book read like a travelogue, which is not to say that it’s dull. Kate’s trek on camelback through Egypt – the Suez Canal has not yet been constructed – is interesting in its own right. Unlike your typical steampunk, Adventures in China doesn’t mess with history. There are no airships to speed her passage. There are some exciting scenes involving pirates and a good deal of intrigue involving an opium ring in China. Although Kate has led a privileged and sheltered life, she has both the skills (languages, shooting, horseback riding) and the courage to see her through danger. This slim book includes some interesting notes by the author about the Opium Wars and brief biographies of all the historical figures mentioned in the story. “About the Author” notes that the book is the first in a ten-part series but only the China book shows up on Amazon, and only in paperback. The author’s website lists several sequels involving Kate’s adventures elsewhere, but I don’t see any way to order them. I assume the author has not completed them, though he has made some blog posts in 2018. 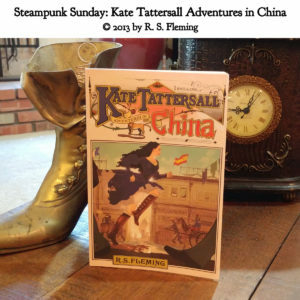 Kate Tattersall Adventures in China is not exactly steampunk in that it mostly stays true to history. Nevertheless, the well-researched and colorfully described historical settings will interest a lot of steampunk fans. Just don’t be deterred by the slow opening! I give it 4 out of 5 gears. * Our Veteran’s Day was originally Armistice Day which commemorated the end of World War I 100 years ago today in 1918. Canada participated as part of the British Commonwealth and paid a heavy price for a nation of only 8 million people. From Wikipedia, Canadian casualties were 67,000 dead and 250,000 wounded out of a total force of 620,000. Thank you very much for the review. I’m glad you enjoyed the tale. The ensuing adventures are not yet published. There are dozens of short stories about Kate on my website, and articles about the 1800s. Very best regards, R.S. Fleming.